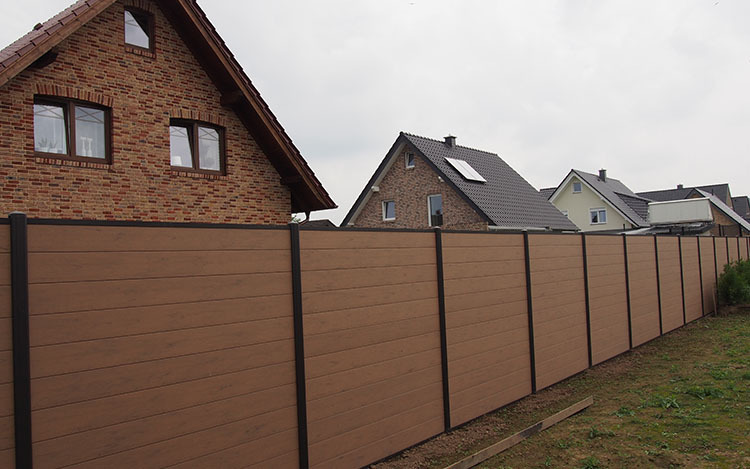 Techwoodn WPC fence is made from recycled wood and plastic, is not susceptible to mildew and insect damage in daily use. Compared to the wood fence, it’s more easy and convenient to clean and maintain. That’s why it will become more and more popular. WPC fence can be cleaned and maintained without any extra cost like spray paint or dying. Usually, we only need to use: soft brushes, water, soap, and broom. Firstly, use a broom to clear the dust and debris on the fence, then wash it with soap and water and clean it with a soft brush, then rinse with clean water to restore your WPC fence to new. In addition, when oil stains are found, should be cleaned as soon as possible to avoid staining. The longer it takes to get rid of the stubborn stains of the composite materials, the higher cleaning cost (time and money) will be. How to Clean WPC Decking? For our WPC fence, 1-2 times per year is normal. Routine cleaning and maintenance can protect the appearance, we do not recommend to use the high strength cleanser to clean your fence, meanwhile WPC fence could not be polished, it may damage the surface.